The International Rules competition between Ireland and Australia has been reduced from two games to one for 2014. It will take place at Patersons Stadium in Perth on Saturday, 22 November. In previous years the nations played two matches on successive weekends and Ireland won the last two series by comfortable margins. Organisers said they wanted to make the contests more competitive, and Australia are now to be represented by 'only the most talented AFL players'. Last year Australia's squad was made up of indigenous players only and, in the history of the series, they have rarely fielded their strongest possible line-up. 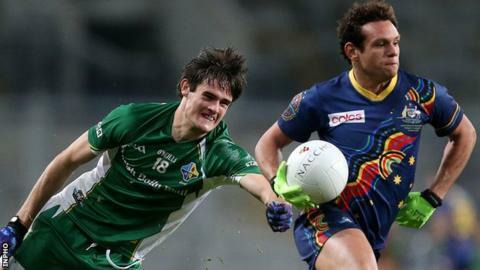 International Rules is played under regulations which are a mixture of Gaelic games and Australian Rules guidelines. Irish and Australian officials said they were considering changing some rules to encourage more AFL players to get involved. The need for a more competitive fixture was underlined by Ireland's 101-point aggregate success in October 2013. The Irish won the first meeting in Cavan 57-35 and the second in Dublin 116-37 to easily retain the Cormac McAnallen Trophy. GAA president Liam O'Neill admitted the future of the International Rules contests would be in doubt if the best players from both countries could not commit to their national sides. "Both associations agreed that the one-sided nature of the last two series has had a major effect on attendances," he said. "It is obvious that if this trend is not reversed in 2014, it would be difficult to argue that there is any sustainable future for the game." O'Neill said that a date in late November would assist with player availability and that, with the best players from each country going head to head, he was confident the sporting public would react positively to what was being proposed for 2014. He stressed that the later date would reduce the clash with county club championships. Last year, Michael Murphy played for his club Glenswilly in the Donegal final less than 24 hours after leading Ireland to victory over Australia in the first Test.